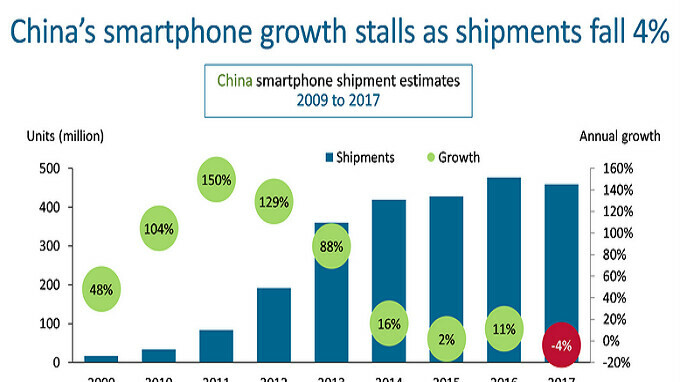 No, 2017 was not a good year for smartphone shipments into China. According to research firm Canalys, for all of last year such deliveries declined 4% from 2016's figure to hit 459 million units. That is the first time ever that the country experienced a year-over-year decline in shipments of intelligent handsets. Had the last three months of last year turned out differently, the growth streak might have continued. From October through December of 2017, just shy of 113 million phones made their way into China. That was a 14% decline from Q4 2016. Huawei remained on top of the Chinese market by shipping over 24 million smartphones during the fourth quarter, a 9% increase over the prior year. For all of 2017, the company shipped over 90 million units. Canalys analyst Mo Jia warns that half of that total consisted of Honor branded phones; the analyst feels that there could be some "internal cannibalization" as competition between the primary brand and the sub-brand increases. While fourth quarter shipments fell for Oppo (-16% year-over-year) and Vivo (-7%), during the three months the pair counted shipments of 19 million and 17 million units, respectively. Both companies did manage to show growth for all of 2017. There was a battle for fourth place during the quarter, and Apple managed to beat out Xiaomi for that position. In all fairness, the P9 was released around the time the S7 was released, and at the time, you couldn't go wrong with any one of these two. Now the P10, while the hardware was impressive, it came with a design that was super outdated with those thick bezels, when everyone was going with a bezeless design. Still, the P10 was 300 dollars cheaper than the S8, so you can forgive it for the few shortcomings you found in comparison with the S8. With that said, I believe it was in 2017 when Huawei leapfrogged Apple and became the second largest smartphone brand. So they're not the ones that suffered in 2017. I might be wrong, but my guess is that the ones that really took a hit are the replica's companies, as people are becoming more aware that they're a waste of money and there are better options for almost the same price. Since when did the P10 have massive bezels?? The top and bottom bezels are bigger than those on an iPhone 8, and those aren't small to begin with. I agree about huawei mate series holding their ground against any flagship. The P series is a bust in my opinion. I was greatly disappointed with both phones. The P9 did little for me with their leica cameras while the s8 was a complete stuttering mess.